When your bathroom is brand new and finished, you’ll be excited to use it. The shower is clean, the towels are fluffed and fresh, and your shampoo and shower gel bottles are tidied away. A newly decorated bathroom instils new habits that will keep the room clean and tidy. These five handy tips are good bathroom habits that will keep your bathroom clean, tidy and well-kept, meaning that you can be proud of your bathroom for years to come. The bathroom extractor fan is a useful way to keep air circulating in the bathroom, especially if there aren’t any windows in the room. Before having a hot shower or bath, turn on the extractor fan, and open a window if you have one, to help the steam dissipate faster. This will help to reduce a build-up of mould or mildew. A lot of maintenance is about learning new habits, and cleaning is no different. After you turn off your shower, squeegee your bathroom wall panels to remove the water from their surface. You can even use the squeegee with window cleaning fluid to rid the shower screen of water droplets. The sink is one of the most used parts of the bathroom, and toothpaste and soap scum can build up there easily. Even if you don’t have much time to clean thoroughly, at least make sure to regularly wipe down the sink with cleaning fluid – it makes a real difference to how clean the room looks. Bathroom storage can be a real problem, so consider buying storage baskets and sorting belongings into them to keep things tidy. You could also rearrange your bathroom cabinet to ensure that things are kept in the right place. This will help to keep surfaces tidy, meaning that they’re easier to clean down week by week. Bathmats and towels are great for accessorising your bathroom as well as serving a practical purpose. Your bathmats and hand towels get a lot of use, so it’s important to wash them regularly and dry them in the tumble dryer to keep them fluffy. 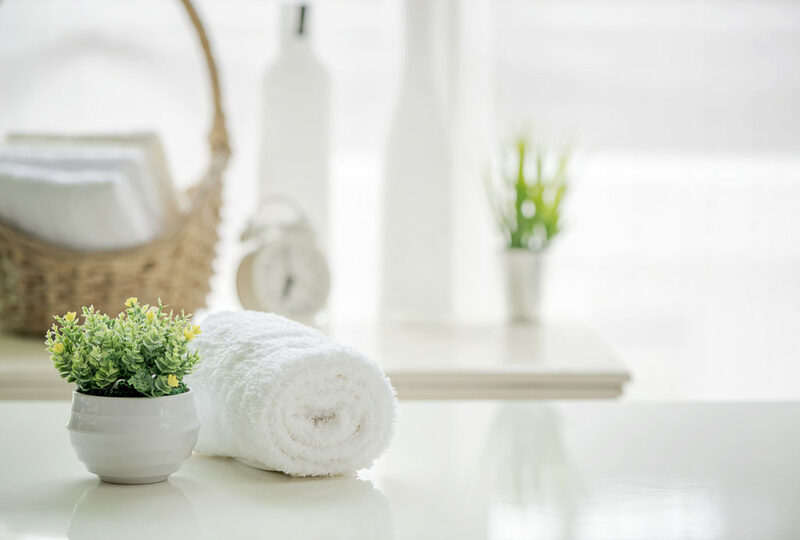 During the day, lay out your towels where possible across a towel rail or radiator as it allows them to dry evenly without bacteria building up that could make them smell damp. Bathrooms get daily wear and tear, and day to day use can mean that your bathroom can look worn easily. Even if you clean your bathroom regularly, eventually there will come a point when you’ll need to replace elements. When planning to redecorate your bathroom, wall panels are a great solution. They are 100% waterproof, and because there’s no grout, it means there’s no chance of mould. Because they’re quick to clean and versatile, they’ll be easy to maintain in the future.